GM Flint Assembly Plant Manager Mike Perez (Left) and Consumers Energy senior vice president for customer experience Brian Rich (Right). 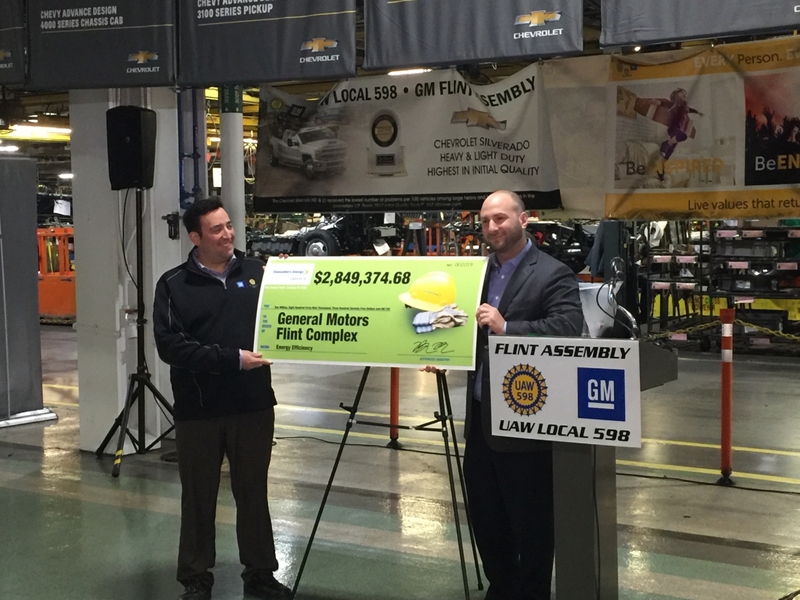 Consumers Energy presented the energy efficiency payment at General Motors’ Flint Assembly, where the automaker has completed 21 energy-saving projects in the last year that included a new energy-efficient body shop and building-wide lighting upgrades. Consumers Energy and General Motors have collaborated on recent efforts that protect the planet. General Motors this year became one of the first two participants in a new program that matches its Flint operations 100 percent with renewable energy. Consumers Energy’s parent company, CMS Energy, also opened a wind farm last year that provides renewable energy to General Motors’ operations in Ohio.